Available Here $29.95 Order Now! 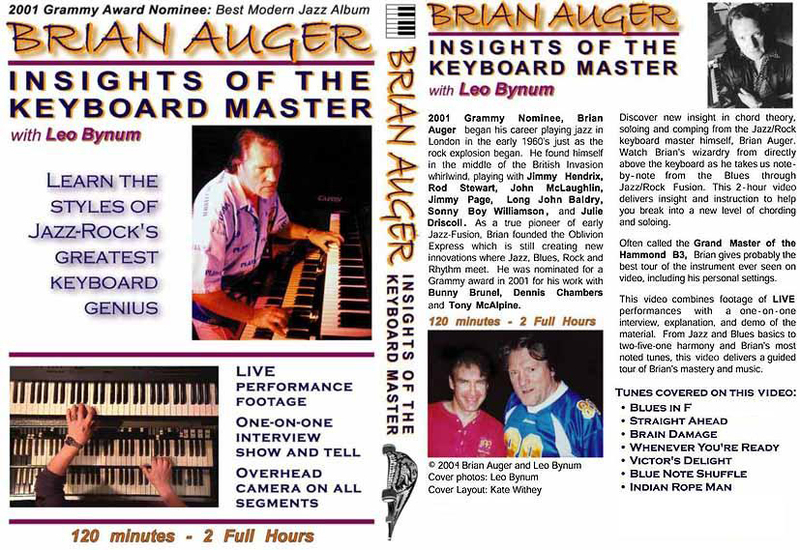 This is the amazing new video by the greatest Hammond B3 player ever: Brian Auger. 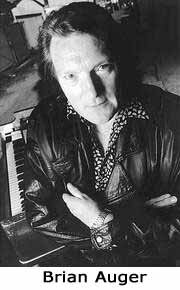 Primarily intended to be an instructional video, this DVD also includes several performance clips of Brian and The Oblivion Express, as well as some great personal insights and reflection on Brian's career. The video's host is Leo Bynum, a student, friend, and long-time fan of Brian's. As a keyboard player himself, Leo directed and produced this video with a student's eye. The content is geared to novice through advanced players with Brian walking you through entire tunes chord-by-chord as well as revealing the secrets to many of his most amazing monster licks. There are overhead cameras for keyboard close-ups on all segments. Support independent artists. From this Web page you are buying directly from Brian and Leo. 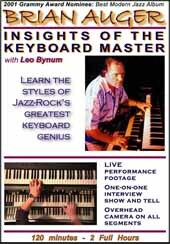 This video is NEW as of January 2004 and now available in DVD format, directly from the source, Brian Auger and Leo Bynum for $29.95 which includes over two full hours of material. This DVD is NTSC - region free - DVD format. Just click the "PayPal Buy Now" button. Payment is processed by PayPal (a secure, 3rd-party online payment service owned by eBay). If you don't already have a PayPal account, you'll be able to set one up. Price is $29.95 USD plus $3.00 shipping and handling for orders to U.S. and Canada ($32.95 total), Europe $4 ($33.95 total). Inquire for special shipping rates. This is an NTSC format DVD. International orders other than Europe and Canada: inquire for shipping rates.